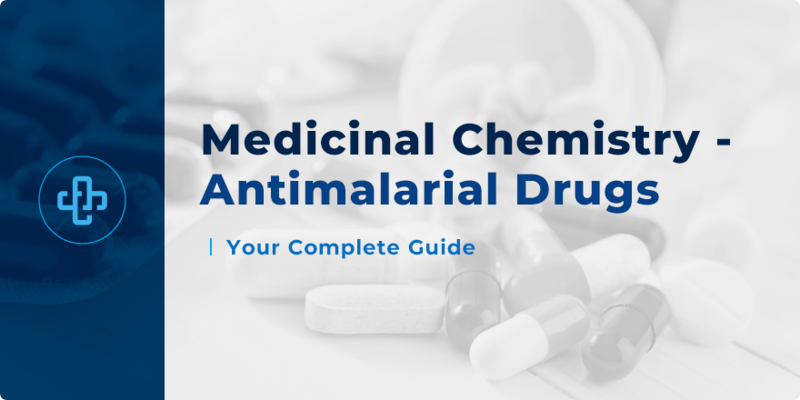 The following article looks at the medicinal chemistry of antimalarial drugs. It will look at – in detail – quinine and quinine-related drugs. In a previous article, we briefly described malaria and artemisinin as a lead compound for new antimalarials. We now turn our attention to the other antimalarial drugs. Understanding the chemistry of these compounds also, as it happens, makes it much easier to comprehend the pharmacology and therapeutic management of malaria itself. 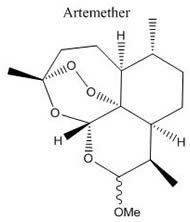 We’ll begin our analysis of the medicinal chemistry of antimalarial drugs by looking at quinine and its related compounds. As described in the previous article, the bark of the cinchona tree contains antimalarial compounds, most notably the highly fluorescent compound, quinine.The Quechea people of South America first discovered the medicinal properties of the cinchona tree. The Jesuits later brought the cinchona to Europe.The bark of the cinchona tree, if made into an aqueous solution was able to treat most cases of malaria.The active principle quinine was first isolated from the bark during the early 19th century. Quinine is the compound that contributes to the bitter taste of tonic water. Drink mixtures containing quinine were consumed by many Europeans staying in areas of the world where Plasmodium-bearing Anopheles mosquitoes thrive. In order to ensure control of the world’s cinchona supply, South American governments began outlawing the exportation of cinchona seeds and saplings during the early 19th century. However, seeds were smuggled from South America to the East Indies. By the 1930s, the Dutch plantations in the island of Java were producing about 97% of the world’s quinine supply. During World War II, the Allied powershad reduced access to quinine following German occupation of the Netherlands and Japanese occupation of the Philippines and Indonesia. Although the US managed to establish cinchona plantations in Costa Rica, many soldiers in the south Pacific and Africa have already died because of malaria. Increasing concern about cinchona supplies and the desire to find quinine alternatives with reduced side effects led to a massive search for novel antimalarials.Chloroquine was one of the drugs successfully developed. The drug was first used during the 1950s.Chloroquine is effective against erythrocytic forms of the Plasmodium parasite. 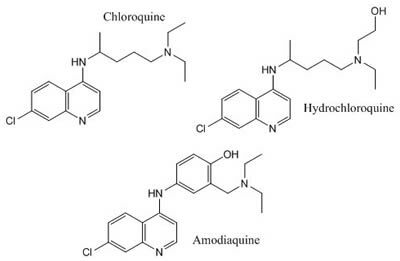 Like chloroquine, the drugs amodiaquine and hydroxychloroquine belong to a class of quinine analogues called 4-aminoquinolines. 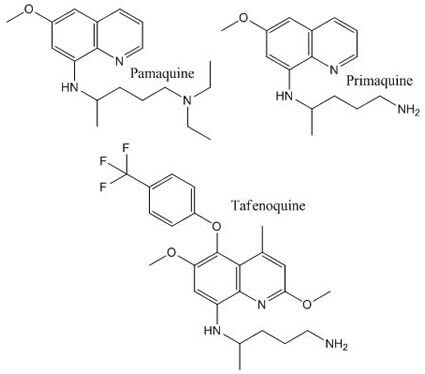 Pamaquine, primaquine, and tafenoquine are antimalarial drugs that belong to a family named 8-aminoquinolines.Pamaquine is closely related to primaquine. Compared to primaquine, pamaquine is more toxic and less effacacious. Tafenoquine is currently in late clinical trials. 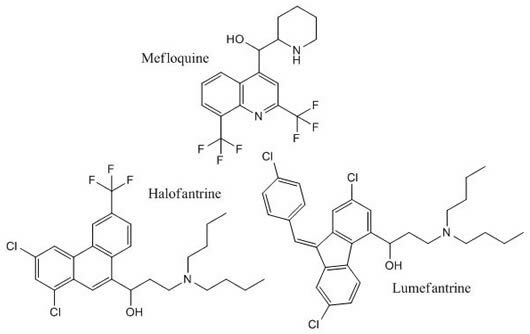 Mefloquine is an orally administered 4-methanolquinoline drug used to prevent and treat malaria.Like the other drugs shown above, the halo substituents deter Phase I metabolism (hydroxylation) of the rings and also contribute to enhanced lipophilicity.Halofantrine contains a phenanthrene ring. The absorption of halofantrine is enhanced when taken with fatty food.Lumefantrine is usually taken in combination with the artemisinin based drug, artemether. Novartis markets the combinationunder the brand names Riamet ® and Coartem®. Take note of how fluorine is used in the design of some of the drugs shown. Can you recall why fluorine substitution is so commonly used in medicinal chemistry? As mentioned earlier, chloroquine is effective against the erythrocytic form of the Plasmodium parasite. Chloroquine is able to accumulate at very high concentrations within the acid compartments of the parasite. At present, the absolute mechanism of accumulation of the drug is still under debate. The erythrocytic stage is also the asexual life cycle stage of the parasite. In order to grow, the parasite degrades haemoglobin (Hb) to acquire amino acids. Several malarial protease enzymes are involved in this degradation process.The digestion occurs within the acidic compartment (food vacuole) of the parasite. Recall from biochemistry that haemoglobin is a multisubunit protein found in the erythrocytes of all known vertebrates. The protein also has iron-containing haem (or heme) groups.For this reason, Hb is a metalloprotein. 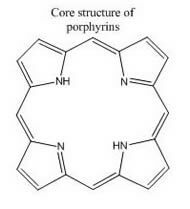 Haemin Hb contains a large heterocyclic ring known as porphyrin. The core structure of this macrocycle consists of four pyrrole subunits interconnected through methine bridges at their α-carbon atoms.Often the pyrrole subunits have other substituents attached to them. An iron ion is contained within the centre of the macrocycle.Also note that by Hückel’s rule, this ring system is aromatic. There are several kinds of haem. Haemoglobin contains Haem B (or Heme B), the most abundant kind of haem. Hb is denatured under the acidic conditions within the parasite’s vacuole. Aspartic proteases are involved during the early stages of degradation of the metalloprotein. 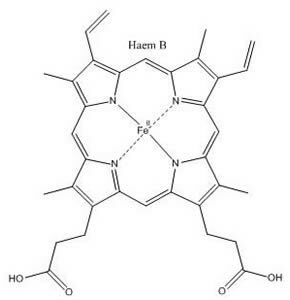 During these early stages, ferric haem (Ferriprotoporphyrin IX or FPIX) is formed. A Plasmodium cysteine protease then cleaves the denatured globin into smaller peptides and amino acids. Plasmodium parasites do not have enzymes that can metabolise the potentially toxic FPIX. Instead, the parasites polymerise free FPIX to a dark crystalline substance called hemozoin. Unlike FPIX, hemozoin is not toxic to the parasite. It is generally believed that chloroquine exhibits antimalarial activity by inhibiting the formation of hemozoin. As a result of using chloroquine, free FPIX is present, causing harm to the parasite. Note that chloroquine is protonated under the acidic conditions of the food vacuole. Electrostatic interactions between the cationic quaternary ammonium group and anionic carboxylate oxygen atoms at FPIX. π-π interactions between the quinolone ring of chloroquine and the porphyrin ring system of FPIX. It is generally believed that the 8-aminoquinolines, mefloquine, and the other 4-aminoquinolines have a similar mechanism of action. The pharmacology and mechanism of halofantrine has not been fully elucidated. Resistance to chloroquine is a major problem which continues to drive the need for new antimalarialsstructurally similar to chloroquine. Resistance to the drug was first documented during the 1950s. During the 1960s, the bisquinoline antimalarial, piperaquine was synthesised. The compound has two of the bicyclic 4-aminoquinoline group. Piperaquine showed excellent activity against resistant parasites. However, the use of piperaquine declined during the 1980s as a result of the emergence of resistant strains of P. falciparum. One disadvantage of amodiaquine is the formation of toxic amodiaquine quinone imine (AQQI) metabolites. At normal doses of the drug, cytochrome P450 enzymes metabolise a small amount of amodiaquine to form the electrophilic AQQI. Glutathione(GS) detoxifies AQQI through nucleophilic attack and the newly formed AQQI-GS is excreted. When a harmful dose of amodiaquine is taken, glutathionedepletion occurs. AQQI is more likely to react with key human proteins that have thiol functional groups; forming drug-protein adducts which can be fatal to liver cells. In a previous article, we described isoquine as a less toxic variant of amodiaquine. In fact isoquine is an isomer of amodiaquine, differing only in the positions of the hydroxyl and the diethylamine. Isoquine’s hydroxyl group is located in the meta position rather than the para position. When OH is in the meta-position, AQQI does not form. 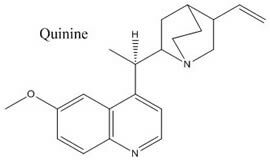 Isoquine has been described as a new lead compound for less toxic 4-aminoquinolines. J. Med. Chem. 1994,37 (9): pp 1362–1370. Fluorine is commonly used in drug design. Due to the difference in electronegativity between fluorine and carbon, there is a large dipole moment and the C-F bond may be involved in intermolecular interactions. Fluorine can also participate in hydrogen bonding interactions. Substitution with fluorine also contributes to increased lipophilicity. In terms of metabolism, medicinal chemists often use fluorine to block parts of the drug that are susceptible to metabolism such as the para-position of benzene rings. 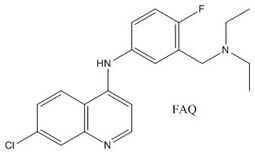 We have already described the formation of the toxic amodiaquine metabolite, AQQI. 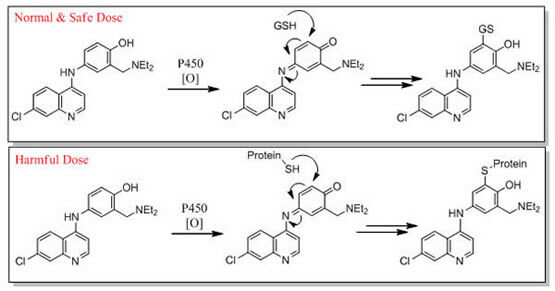 With these things in mind, medicinal chemists designed a series of fluoro-substituted variants of amodiaquine and found that the compound shown below exhibited the desired metabolic stability. Pyronaridine is an antimalarial compound first synthesised at the Institute of Chinese Parasitic Disease in 1970. The compound exhibits high potency towards P. falciparum and some chloroquine-resistant strains. Studies of mouse models showed that pyronaridine is active against the erythrocytic stages of malaria. When used in combination with other antimalarials such as artesunate, the emergence of resistance appears to be slowed down considerably. 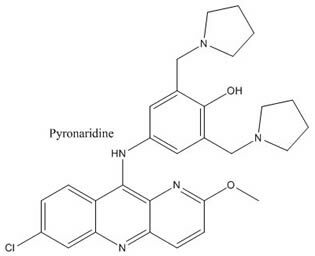 Current studies suggest that pyronaridine is an ideal candidate for combination therapy with artemisinins.Pyronaridine’s core structure is similar to mepacrine (quinacrine). The drug is typically administered orally as pyronaridine tetraphosphate which appears yellowish and has a bitter taste. The drug can also be administered via the intramuscular or intravenous route. Sulfadoxine (or sulphadoxine) is a sulfonamide drug that was used in combination with pyrimethamine to treat or prevent malaria. However, due to the emergence of resistance, its use has been reduced. Sulfadoxine acts by competitively inhibiting plasmodial dihydropteroate synthase, an enzyme not biosynthesised by most eukaryotes including humans. Often used in combination with other sulfonamide antimalarial drugs, pyrimethamine is also an antifolate drug. Pyrimethamine acts on the dihydrofolate reductase enzyme. Pyrimethamine is administered through the oral route and is well-absorbed. This drug is also used in the treatment of Toxoplasma gondii infections in immunocompromised patients. Pyrimethamine is also currently being investigated as a treatment for Amyotrophic Lateral Sclerosis (ALS), also known as Lou Gehrig’s disease. Growing resistance to current antimalarials poses a grave threat to human health. There is a great need to discover and design new antimalarial compounds – ones that show a greater safety and efficacy profile. This endeavour ensures not only a more sound pharmacology but also a significantly improved knowledge of the medicinal chemistry of antimalarial drugs themselves, and how they operate at the fundamental level. Hopefully this article has sparked some degree of understanding into this highly pertinent topic. Proc. Natl. Acad. Sci. U S A. 23 July 2013; 110(30): pp E2838–E2847. Org. Process Res. Dev., 2014, 18 (2): pp 349–353. Cysteine Proteases of Malaria Parasites: Targets for Chemotherapy. Current Pharmaceutical Design. 1 August 2002; 8(18): pp 1659-1672(14).